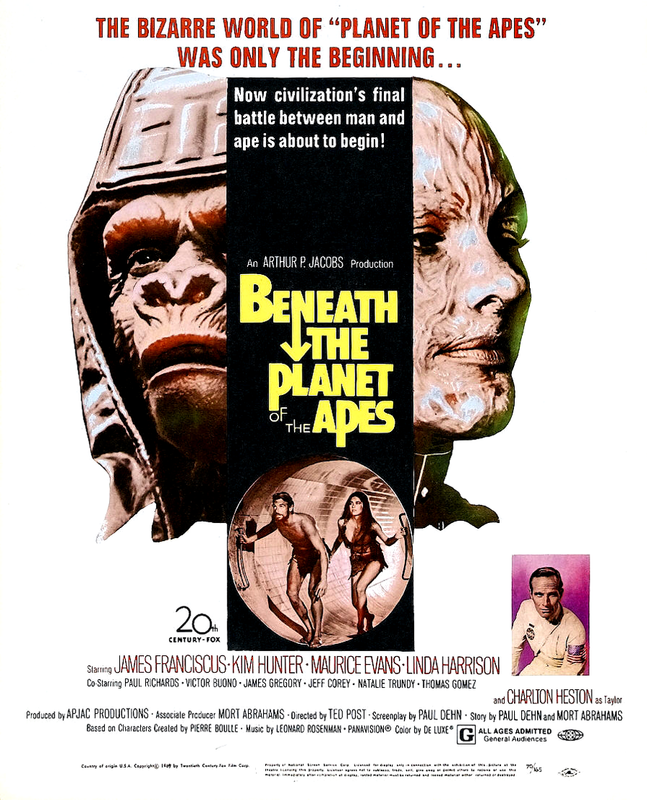 Planet of the Apes was such a mega-success, both critically and financially, that 20th Century Fox called producer Arthur P. Jacobs and told him “start working on a sequel.” Jacobs knew that Charlton Heston’s participation was paramount, so his first move was to lock down his star. Unfortunately for Jacobs, Heston had no interest in continuing a story that ended about as perfectly as a movie can end, and initially refused. But Jacobs kept working on him, and eventually they found middle ground: Heston’s Taylor would appear, but briefly, mostly just to be killed off. Jacobs found an ingenious way to give the illusion that audiences were getting more Taylor than they really were: Heston shows up in the opening moments of Beneath, only to mysteriously disappear. The plot then partly hinges on finding Taylor, who reappears at the very end, going out with a literal bang. Great set-up, but what to do in the middle? Moments after Taylor vanishes (which is witnessed only by the mute Nova, played once again by Linda Harrison), a second space ship lands, this time piloted by an astronaut named Brent (James Franciscus, sort of a TV-sized Charlton Heston). Brent gets his requisite “Oh my god, it’s a planet run by apes!” moment, and soon he befriends Cornelius and Zira (played by David Watson—subbing for Roddy McDowall—and the returning Kim Hunter). In the wake of Taylor’s appearance, ape society has been upended, and the fearsome General Ursus (the great James Gregory) is rising to power. Ursus wants to storm the once-inviolable Forbidden Zone, much to the displeasure of Dr. Zaius (Maurice Evans, better known to Batman ’66 fans as the Puzzler). Ursus and his armed band of gorillas chase Brent, and he escapes by going… beneath the planet of the apes! Brent recognizes a blown-out cave as the ruins of the New York subway system, forcing upon him the same grim realization Taylor came to when he went tourist. But Brent barely has time to take it all in before being discovered by a small band of nuclear war-ravaged humans, whose telepathic powers try and force Brent to kill Nova. Have a fun summer, kids! Beneath of the Planet of the Apes is highly entertaining nonsense. Directed by TV veteran Ted Post, it cheerfully jettisons all pretenses of subtlety, replacing them with broader, more obvious social commentary and various elements culled from other sci-fi movies. Brent doesn’t have much of an emotional journey, as he sprints from set piece to set piece. 20th Century Fox severely reduced the budget, so there are scenes where the background apes are clearly wearing Halloween-style masks instead of the brilliant John Chambers make-up. While Planet of the Apes was trying to appeal to a wide audience, Beneath, is content to be a genre exercise. It’s still a lot of fun, but its aim is so far below the original that there’s really no comparison. Ending the film with the literal End of the World is audacious, but it feels like a desperate way to beat the original’s iconic ending. Still, you have to admire how the producers and the studio were willing to go for broke with this sequel. Usually, if a movie studio realizes it has a franchise on it hands, it does what it can to extend the series as long as possible, delivering the illusion of change, just so all the popular characters can be ready for the next installment. Instead, Beneath cheerfully tops the first film when it comes to delivering a gut-punch of an ending. The final scene doesn’t have the resonance of the first—we’re just not as emotionally invested in any of the characters as we were to Taylor—but you have to admire the guts it took to end a G-rated(!) movie with a mass extinction of all known life on Earth. 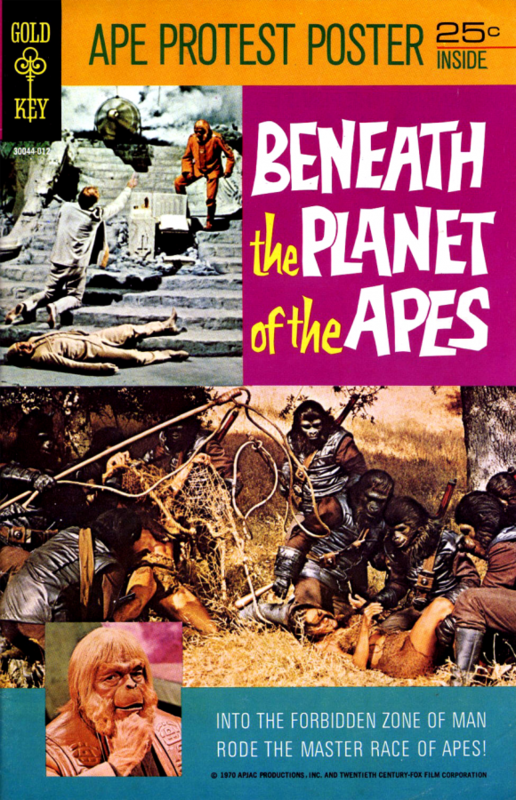 Beneath the Planet of the Apes was given a contemporary comic-book adaptation, courtesy of the well-intentioned but emotionally… reserved folks over at Gold Key. 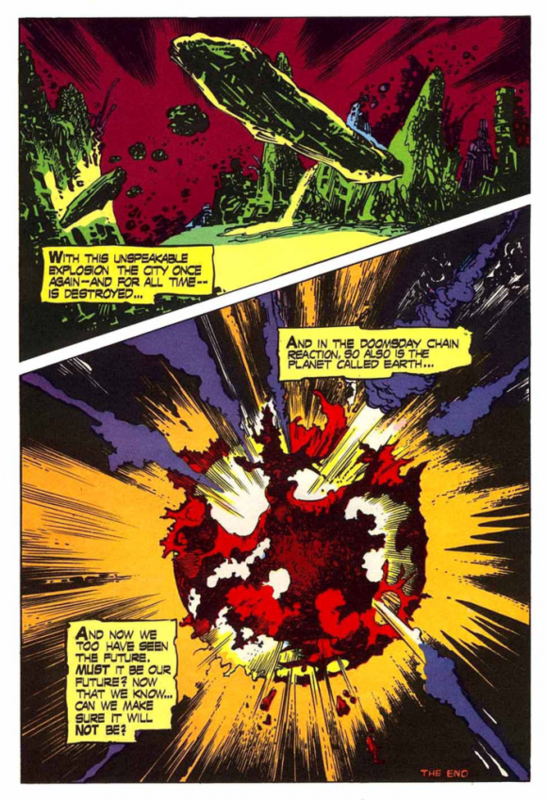 Drawn by Alberto Giolitti (who worked on Turok and Star Trek for the company) and Sergio Costa, the one-shot dutifully follows the film’s plot, including the messed-up mutants and apocalyptic ending. It also comes with a handy “Ape Protest Poster,” which I assume went up on many a kid’s bedroom wall, right next to Raquel Welch from One Million Years B.C. 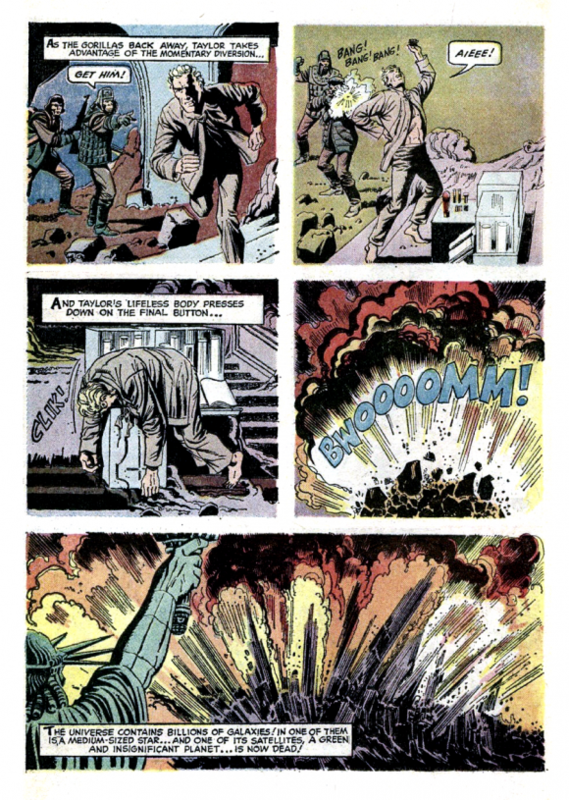 As it did with the first entry in the series, Marvel adapted the film in its black-and-white Planet of the Apes magazine, in Issues #7-11, a few years later. (They were reprinted in color in the standard-sized Adventures on the Planet of the Apes soon after.) Once again written by Doug Moench, this time the art is from the distinctive brush of Alfredo Alcala. 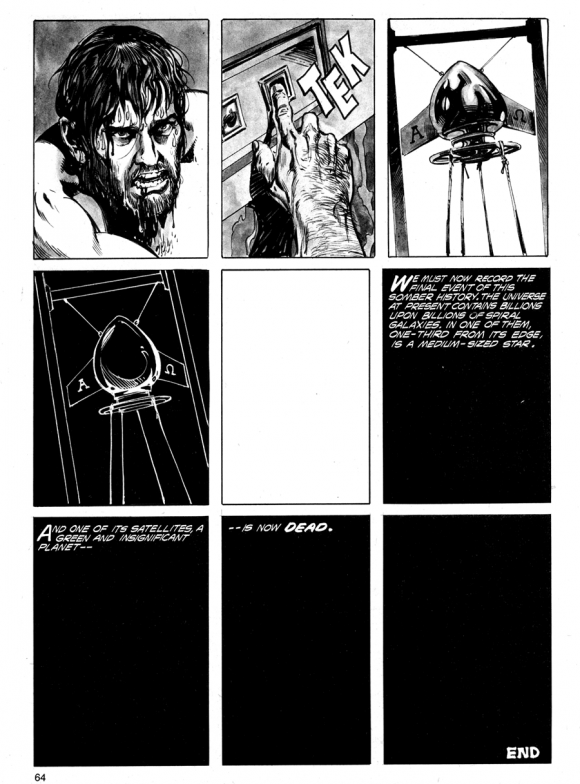 This version of Beneath feels a lot less comic book-y than the George Tuska and Mike Esposito version of Planet (click here), somehow making the whole thing seem less preposterous, a little more cohesive and grounded. Power Records got in on the act, as well, continuing its tradition of passing off horribly downbeat, dark stories as children’s entertainment (though, in their version, it is one of the mutants that sets off the bomb, not the bloodied hand of Taylor). Of course, the end of the world didn’t stop the Apes series, and 20th Century Fox would find a clever—and cost-effective—way to keep the story going. NEXT: Escape From the Planet of the Apes. Click here. Rob Kelly is a writer/artist/comics and film historian. He is the co-host of Aquaman and Firestorm: The Fire and Water Podcast, the host of The Film and Water Podcast, and the host of TreasuryCast. He’s working on a spec script, Around the Planet of the Apes in 80 Days.